When my favorite Manly Monday contributor, John Rich told me he was going to Cabbagetown to get an old style haircut, I jumped at the chance to tag along. He was headed to Mary Todd Hairdressing Co, the speak easy of hair. Mary Todd is incredibly eclectic and tastefully nostalgic inside as you'll find quirky prints, interesting dioramas and vintage art throughout. Plus, customers are all welcomed with a tasty beverage. John's pick was a PBR. John's stylist was the talented Krista Stegall, who specializes in hair color. As John shared that he'd like a 1930's type of gentleman's cut, Krista decided on a low fade with length left on top for him to part and comb over. And this haircut takes some time- a lot of precision and care was taken to get it just right. 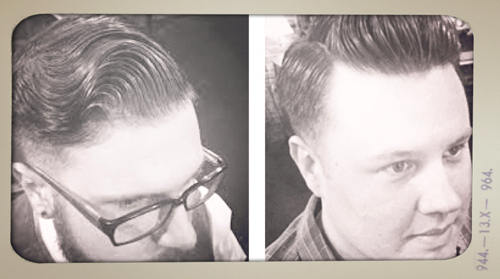 All vintage cuts need high quality pomade. Krista and the owner Steven have been working for months to create their own version made of soy wax and all natural ingredients. 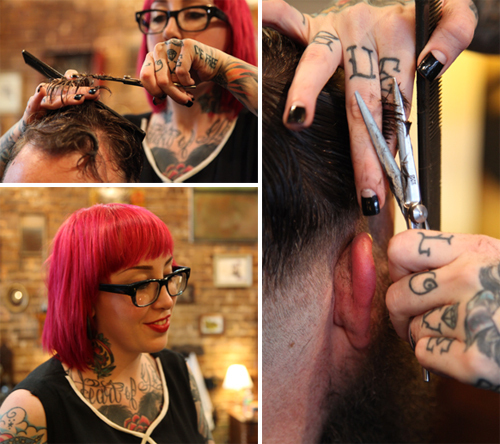 They call it Stay Sharp Pomade and it can be used for both the hair and beard. Find it in person at their shop or contact them directly to learn more.